"Biocultural diversity: The inextricable link between biological and cultural diversity"
There is growing evidence that most biodiversity rich landscapes overlap with areas inhabited by Indigenous Peoples and local communities. Moreover, this overlap is not due to randomness, but rather it can be explained through the intricate relations between biological diversity at all its levels and cultural diversity in all its manifestations, or what is known as biocultural diversity. In this talk, I will present results from research conducted among the Tsimane’, a hunter-horticulturalist society in the Bolivian Amazon, analysing how changes in Tsimane’ culture (i.e., acculturation and integration into the market economy) reflect in their landscape and different indicators of floristic and animal diversity. The talk will conclude with a discussion of how understanding the links between biological and cultural diversity is critical for more effective and inclusive approaches for biocultural diversity conservation. Victoria Reyes-García (Ph.D in Antropology, 2001, University of Florida) is ICREA Research Professor at the Institut de Ciència i Tecnologia Ambientals (Universitat Autònoma de Barcelona). Her research addresses the benefits generated by local ecological knowledge and the dynamic nature of these knowledge systems. 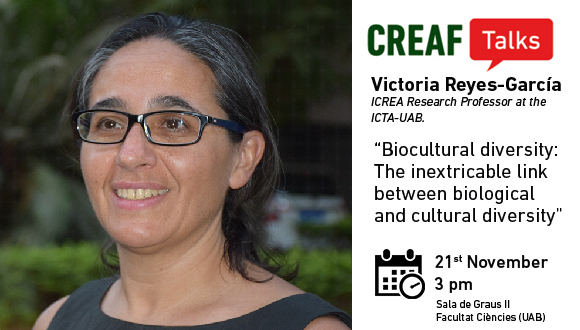 She coordinates the Laboratory for the Analysis of Socio-Ecological Systems in a Global World at ICTA-UAB. Between 2010-15, she directed an ERC Starting Grant to study the adaptive nature of culture using a cross-cultural approach. In 2017 she received an ERC Starting Grant to study local indicators of climate change impacts.